Every week Google is asked to remove more than four million URLs from its search engine. While these automated requests are usually legitimate, mistakes happen more often than one might expect. In a recent DMCA notice HBO asked Google to censor links to HBO.com, as well as several other legitimate sites and blogs. In common with many other websites on the Internet, Google has an obligation to remove infringing content upon receiving a valid DMCA request from copyright holders. Starting a few months ago copyright holders drastically increased the number of notices sent, totaling more than 50 million last year. While many of the submitted URLs do indeed link to infringing content, there are also occasional mistakes, often caused by automated filters. Not a big surprise considering the number of requests that go out, but these mistakes can still be quite embarrassing. Today, for example, we stumbled upon a DMCA notice sent on behalf of HBO in which Google was asked to remove “infringing” links to ‘Eastbound and Down’ content in HBO’s very own store. And that’s not the only mistake they’ve made. The same DMCA notice also lists various other legitimate sites, including Perez Hilton’s blog, Pinterest, MTV.com and IGN.com. 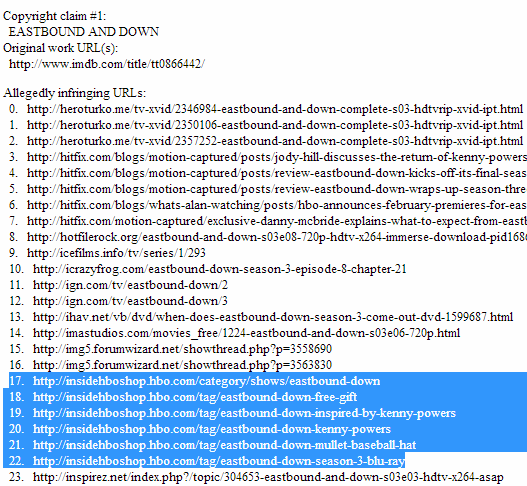 All sites wrote reviews or news articles about HBO content, but there were no links to pirated content. It is worth noting that the DMCA notice in question was sent by DtectNet. This is the anti-piracy division of MarkMonitor, the same company that is also responsible for tracking down BitTorrent pirates as part of the upcoming six-strikes anti-piracy scheme. The good news is that Google appears to have caught quite a few of these erroneous claims, meaning that not all of the reported sites are censored. However, this task isn’t getting any easier as the number of notices continue to increase. At least it provides us with content to write about, although with the text “Eastbound and Down” appearing in this article too, who knows how long it will remain indexed by Google….